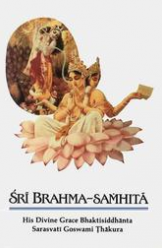 …If a devotee at all wants to cleanse his heart, he must chant and hear the glories of the Lord, Śrī Kṛṣṇa (śṛṇvatāṁ sva-kathāḥ kṛṣṇaḥ). This is a simple process. Kṛṣṇa Himself will help cleanse the heart because He is already seated there. Kṛṣṇa wants to continue living within the heart, and the Lord wants to give directions, but one has to keep his heart as clean as Lord Caitanya Mahāprabhu kept the Guṇḍicā temple. 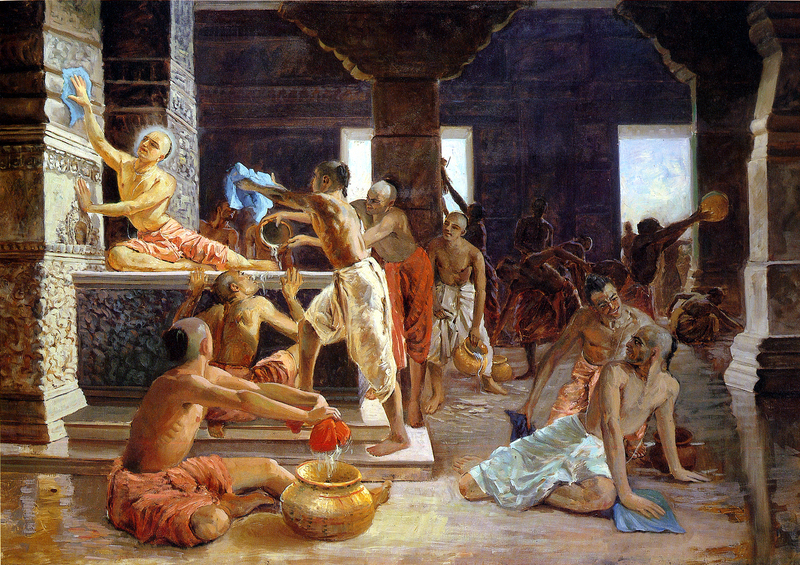 The devotee therefore has to cleanse his heart just as the Lord cleansed the Guṇḍicā temple. In this way one can be pacified and enriched in devotional service. 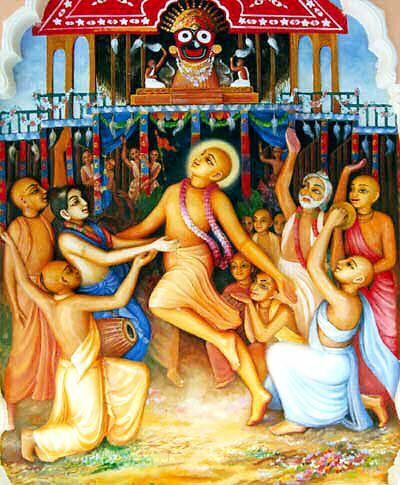 May the Supreme Personality of Godhead, Śrī Kṛṣṇa Caitanya, who danced in front of the car of Śrī Jagannātha, be all glorified! By seeing His dancing, not only was the whole universe held in wonder, but Lord Jagannātha Himself became very much astonished. All glories to Śrī Kṛṣṇa Caitanya and Prabhu Nityānanda! All glories to Advaitacandra! 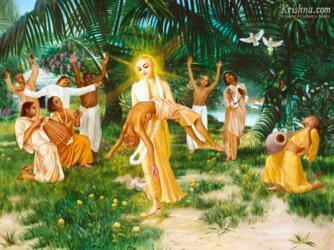 And all glories to the devotees of Lord Śrī Caitanya Mahāprabhu! All glories to the listeners of Caitanya-caritāmṛta. Please hear the description of the dancing of Lord Caitanya Mahāprabhu at the Ratha-yātrā festival. His dancing is very enchanting. Please hear of it with great attention. This material world is just like a big ocean. It begins with Brahmaloka and extends to Pātālaloka, and there are many planets, or islands, in this ocean. Not knowing about devotional service, the living entity wanders about this ocean, just as a man tries to swim to reach the shore. Our struggle for existence is similar to this. Everyone is trying to get out of the ocean of material existence. One cannot immediately reach the coast, but if one endeavors, he can cross the ocean by Śrī Caitanya Mahāprabhu’s mercy. One may be very eager to cross this ocean, but he cannot attain success by acting like a madman. He must swim over the ocean very patiently and intelligently under the instructions of Śrī Caitanya Mahāprabhu or His representative. Then, one day, he will reach the shore and return home, back to Godhead.